Hey Personal Financial Freaks! This is my tenth Dividend Income Summary for 2016. As you can see on my Passive Income page, 6 companies chipped in for this month of October. This is not a big number in terms of company (nor in income), but remember I do not hold a lot of them. I keep my holdings to a minimum of 20. Why? Because I consider this amount to be more than enough to feel well diversified. People tend to forget that sometimes their holdings are already pretty well diversified. Take for instance Power Corporation (POW). When you are buying POW you are actually buying stakes in various companies throughout the world : Pernod Ricard, LafargeHolcim, Total, WealthSimple, etc. They also own directly or indirectly insurance companies (London Life, Irish Life, Great-West), financial companies (Group Investors, Mackenzie, etc.) as well as many funds like Sagard China. Needless to say this company is well diversified. This is true for many companies. So before going on a buying spree and stacking up as many companies as you possibly can, remember to consider wisely what exactly you are investing in. Maybe then you will realize that you won't need to invest in this particular sector or region simply because you already have. Not much too add considering the current state of the Market. It's pretty pricey and I don't see much buying occasions on my part. I don't plan on holding new positions so I will have to wait for some drops on my actual shares. I might add some Cominar (CUF.UN) at some point... Will see. Nice job Monsieur Dividende! Agreed that the market is pretty pricey, what level are you waiting for it to drop to? Thanks man! Well, I won't be following the Market per se (as a whole). But if some of the shares drop by 10-15% I will most likely buy a few. Having said that, I would particularly like to add shares in sectors such as telecom (BCE), consumer (discretionary or staples), etc. Like I said I will refrain from opening up new positions, but if shares of McDonald's, Walmart or Colgate-Palmolive get cheap... I might. The Canadian Dollar has to pick up too. So it's a long time affaire as you know already. Solid payouts for the month from a few that I hold too. 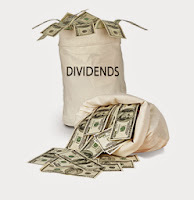 Always love seeing Canadian banks making payouts to quite a few dividend investors. It just shows how solid those institutions are. Thanks for sharing. Hey DivHut. Yeah, we do share some companies. And I tooI love those big juicy canadian banks dividends. Thanks for passing by.